The life story of filmmaker John Milius, one of the most influential and controversial film directors of his generation, is, you won't be in the least bit surprised to learn, the subject of the documentary Milius. Made by debut directors Joey Figueroa and Zak Knutson, the documentary follows Milius’ childhood aspirations to join the military, his formative years at the University of Southern California Film School, his legendary work on films such as Apocalypse Now, Jaws, Conan The Barbarian, Dirty Harry and Red Dawn, to his ultimate dismissal from Hollywood due to his radical beliefs and controversial behaviour. Millius turned his hand to writing after he was refused entry to the US marine-corps because of his chronic asthma. He was able to sell his early screenplays for record amounts and forged a Hollywood career alongside his USC Film School contemporaries Steven Spielberg and George Lucas (both of whom feature in the documentary). However his volatile character, right-wing extremism and penchant for guns and machismo made Milius an outsider in Hollywood as time went on. A self-styled "Zen Anarchist", Millius was reportedly the inspiration for the hot-tempered Walter Sobchak (played by John Goodman) in the Coen Brothers’ movie The Big Lebowski. Milius was compiled using clips from the movies in which he was involved and includes interviews with such Hollywood luminaries as Francis Ford Coppola, Harrison Ford, Michael Mann, Robert Zemeckis, Oliver Stone, Bryan Singer, Charlie Sheen, Matthew Weiner and many more. Milius is a unique and extensive look at the life of a truly one-of-a-kind storyteller. 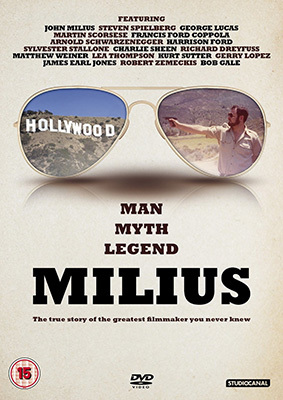 Milius will be released on UK DVD on 18th November 2013 by Studiocanal at the RRP of £19.99.